At the NAN Headquarters, your home at our home may range from the humble Bunkhouse Cabins to the luxurious, exquisitely decorated western bungalow-style Rancher's house, to the group-sized Lodge. Following views and a map of the Headquarters, below, are photos of the rentals available. The Rancher's House was built around 1912 as the first "fancy modern" home on the NAN. Its solid, homey Western Craftsman aesthetic is emphasized and celebrated by the 1949-1950 furniture and furnishings custom-designed by W.R. Dallas of Dallas Studios in San Antonio, Texas. Mr. Dallas, renowned for his mid-century "ranch-style" artisanship, traveled to remote Grant County, New Mexico to measure and specify sizes, arrangements and soft furnishings for this house for Clara Hinton, grandmother of the current owners. Little has been added or changed in 65 years, so a stay in this house is a blast from the cowboy past. The Bunkhouse offers basic, tidy accommodations with new mattresses, clean bedding, plentiful towels, and fully equipped though definitely not high-end or newly appointed kitchens. Floors are polished concrete, except in the north end bedroom, which is wood. Up to two well-behaved dogs are welcome in each cabin/apartment, with deposit. Guests find the Bunkhouse offers a more rustic, less formal environment than the "courtyard accommodations." 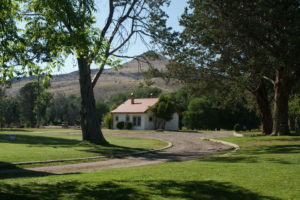 When drought restrictions are not necessary, Bunkhouse guests may use the wood-or-charcoal barbecue pit or enjoy a wood fire in the fire pit, and have access to tables and chairs that allow ample outdoor time. The NAN Ranch's original cookhouse/foreman's home is now a group accommodation that was renovated for such uses as retreats, student and scout trips, and outdoors excursions, and family reunions. The Lodge offers a large kitchen and food service area and wet bar, adjacent to the large Lodge Room. The lodge's long enclosed porch offers lots of comfortable seating, and an additional large "option" room may be set up for meetings, furnished with bunks for sleeping, or may remain available for additional seating and lounging or table games. There are two group bathrooms each with 3 showers, 3 toilets, and 3 sinks plus a separate bathroom that offers practical though not officially compliant accessibility for most wheelchairs and for people with other mobility limitations. A central bedroom offers standard beds for 2 persons, and the standard arrangement features another bedroom and 2 sleeping porch areas equipped with twin-sized, full-length bunks for 14 bunk sleepers. An additional 7 bunks may be placed in the option room, making a total of 14 bunks for 28 bunk sleepers. Other sleeping arrangements may be available on request. Guests may rent the Lodge with sheets, towels, and pillows, or for a more camp-like experience group members may bring their own or use sleeping bags on our bunks. As with the rental of all NAN housing, housekeeping service is not provided during your rental period. All food and drinks must be provided by the guests or their organization. The NAN ranch can suggest a local caterer, but does not cater. The Lodge's kitchen is suitable for caterer use. For weddings and other celebrations, or for groups whose diversity requires varying levels of convenience and comfort, the NAN Ranch is happy to consult and arrange a combination of rental options. For your event, you may rent all or any combination of the headquarters rentals, depending on your needs, your plans, and the size of your group. Because every event is unique, the NAN Ranch will quote yours based on your specific plans. All food and drink must be provided by the wedding party or a caterer. The NAN Ranch can provide a list of caterers known to us, but makes no warranty about their services. Event rentals include at minimum the rental of the Lodge. While the NAN's furniture and furnishings are available for any guests' use, we do not maintain banquet/party furniture or equipment. Any tables, chairs, tablecloths, additional or bulk dinnerware, décor, or other event requirements must be provided by the guest or her/his caterer. The NAN Ranch is an agricultural property with large areas of wild terrain. Cattle ranching is conducted at the Ranch. Associated activities include but are not limited to heavy equipment operation, irrigation, predator control, and animal husbandry. The rental premises are neither separated nor protected from these activities or from the presence of wild animals. Wildlife that may be dangerous to humans or pets live on the ranch. This includes but is not limited to bears, coyotes, wildcats, javelina (collared peccaries), deer, elk, antelope, rattlesnakes, badgers, raccoons, skunks, stinging insects and arachnids, hawks, owls, and others. While all of these animals will avoid contact with humans if possible, they may attack under some circumstances. It is the responsibility of each individual to acquire general knowledge of how to avoid injury in contact with wildlife. The climate, terrain, and fauna also may represent danger to humans. Renters and guests must protect themselves against sun exposure in all seasons. The extremely dry climate requires extra supplies of water, and anyone leaving the headquarters for trails on foot or in vehicles must take ample backup water. The terrain features steep inclines, rocks, boulders, and gravelly surfaces that pose falling risk. Sturdy shoes or boots with soles that protect the feet and stand up to harsh terrain should be worn at all times outside the headquarters. Many native plants have thorns or barbed needles, and some poisonous if ingested. It is the responsibility of each individual to use caution to avoid mishap in the environment.